This entry was posted on Thursday, February 4th, 2010 at 11:20 am	and is filed under Books Films Television, Interview. You can follow any responses to this entry through the RSS 2.0 feed. You can leave a response, or trackback from your own site. But the left hemisphere displays an unreasonable certainty that its own mechanistic construction of the world is the only one that has any validity. The more entrenched its way of thinking becomes, the more it undermines the basis on which we might have been able to transcend its narrow way of thinking. Remember that it deals with what it already (thinks it) knows. ‘Unreasonable certainty’ is a belief mistaken for knowledge. Our bodies have emotions related to knowledge: simple ones like curiosity, surprise, wonder, anxiety, “feeling idiotic,” and big ones – Awe and Horror. Both awe and horror negate the sense of self, violate self-concepts, concepts about others, and our understanding of the world, and demand accommodation. Accommodation is the process of discarding old, nonadaptive beliefs for more productive, insightful beliefs. Our beliefs are not about ‘the truth,’ they are about ‘most useful.’ The are designed to help us behave best in the face of unique challenges. So the emotions of awe and horror compel accommodation; in other words, force us to learn and adapt. This is an excellent interview, which I will be returning to re-read. As someone who has been directly involved in research and speculation about this matter for some 20 years now, it is refreshing to see someone who can direct the force of years of independent research at what will turn out to be one of the most crucial topics in human cognitive evolution, and may supply the keys to the many mysteries of human behavior that haunt us individuals and become catastrophic at the scale of our group intelligence. It is not trivial that half of our minds, the half that largely owns, or is supposed to own, our waking consciousness wants the other half dead. At the scale of the species ‘the other half’ is, as it long has been, most of what lives, breathes and moves — for living beings themselves are both an affront and a threat to an entity comprised entirely of uninhabitable abstractions. If the capacity to predict the outcomes of events is a power, nothing is enhances that power like omnicide. In such a game, one’s predictions are tautologies: nothing is easier to predict and master than dead terrain. The seeming power of prediction (one of the crowing glories of our representational intelligence) hides a deadly and mimetic terrain-predator. It is unclear if our planet can survive the L(r) (vs R(l)) paradigm that currently dominates the majority of living individuals and is thus expressed in and as their culture . Strangely, when the other half of our intelligence is inhibited (the half representing the source, in McGilchrist’s position — one I have long argued and substantiated independently) the outcomes are not generally friendly to either human beings or living things in general. This problem has come to a head, for the rapacious technological ‘progress’ (read: omnicidal conversion of anciently conserved biosystems to objects and luxuries) has gained such momentum that its capacity to consume has now extended directly into our own bodies, and, I daresay, the fundamental capacities we depend upon as our ‘intelligence’. In short, our intelligence is attacking itself, through our world. Given the modern sophistication and aspirations of homo sapiens at the group level, within the next 1 to 3 generations we will see radical upheavals and, I expect, severe and exotic expressions both of this problem and its related organs, and of the experimental solutions we may institute. For my part, I have had direct experience of nonordinary aspects of hemispheric dominance relations, and I suspect that what the effulgent left-hemisphere is hiding, unbeknownst to us, is an entire set of sensing and relational intelligence assets whose character would render our wildest fictions tedious in comparison. In fact, I think we will discover a new universe shortly. Not beyond the atmospheric barrier. Within it. Within us, where it’s been gestating for at least some 50,000 years. And more than that I suspect we will discover that there is a linked domain of cognition, a transentient substrate, embedded in timeSpace, if you will, which is the well-known companion of our Right hemisphere, and is also the source of many of our myths — and perhaps, even, our languages — but that is a far more radical hypothesis, and one whose testing will require pioneers of uncommon intellectual and emotional capacity. Let us hope we can sustain ourselves long enough to become them together. Mr. McGilchrist seems to have spent too much time on his remote island detached from modern communications media. Nowhere in his beautifully written book is Marshall McLuhan mentioned, or the effects of media technologies on perception. While philosophers still debate the levels of influence screen media plays upon human consciousness, few would doubt we live in a highly pervasive pop culture. McGilchrist’s analysis of how brain lateralization shapes culture suffers from what McLuhan coined the ‘rear-vision mirror’, i.e. we evaluate present environmental media via nostalgic metaphors of the past. Their effects therefore remain invisible to us. Since the 1960s explosion of TV, media ecologists have been examining the considerable shifts in cognitive perception, with many reporting a gradual feminization of the male psyche (70s sexual liberation, 80s androgyny, 90s metrosexuality). So where exactly has McGilchrist been residing? If the latest studies on the numbing effects of digital media on critical thinking are correct (Carr, 2010) McGilchrist’s argument should be championing a left-brain renaissance. 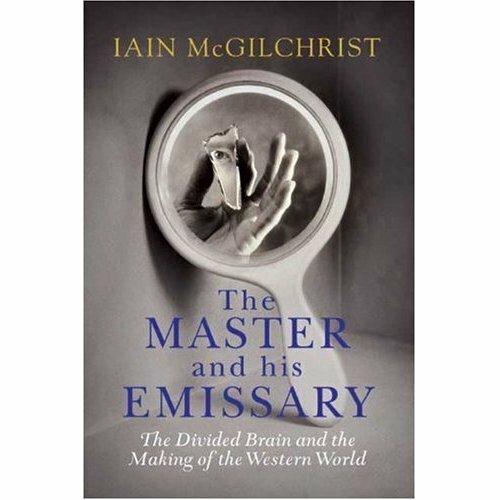 Without fully examining such effects, McGilchrist’s thesis fails to offer any genuine alternative to either Jaynes or McLuhan, barely moving beyond the linear technophobic conclusions of Heidegger. The world is implosively electric McGilchrist, I suggest you plug in before it’s too late. Perhaps it’s just me but I found that I had missed many subtle points which presented themselves upon my 2nd read or this enlightening book. Nice, I had the same experience after reading it the 2nd time. I’m about to crack it open for a third!